Writing letters or buying postcards and stamps may not be as popular as they once were. But that doesn’t mean the post office’s value has diminished. It offers many other services now. For instance, did you know you could invest in Post Office Monthly Income Scheme? 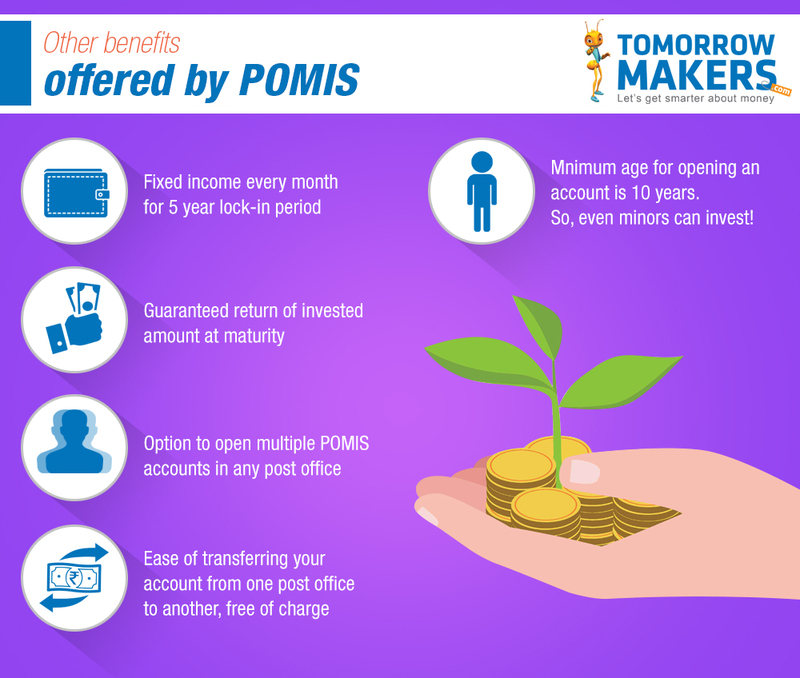 The Post Office Monthly Income Scheme (POMIS) is a mid-term savings plan, which can help you earn consistent returns. It is an income scheme offered by the Indian postal service, which offers guaranteed returns to investors. Opening an account under this scheme can ensure you enjoy regular interest payments every month. As of May 2017, the interest rate offered on this scheme is 7.6% per annum. In comparison to this, the current interest rate offered by the State Bank of India (SBI) for a mid-term fixed deposit is around 6.9% per annum. This shows investment in post office can be a good savings plan. Consider the case of Sugeet Sundar. Sugeet, a senior citizen, invested Rs 2 lakhs in POMIS for a maturity period of five years. At the time of investing, the scheme offered 7.7% interest per annum. During these five years, Sugeet will earn a monthly income of Rs 1,283.33. Once the tenure ends, his original investment of Rs 2 lakhs will be returned to him. The interest amount can be withdrawn every month, serving as an additional source of income. Alternatively, he can let the amount accumulate in the account for a few months. However, the idle money will not earn any extra interest. Sugeet has another option to make the most of the monthly interest the investment earns. He could link his POMIS account with a recurring deposit (RD) or mutual fund SIP, which will allow him to reinvest that amount. This can ultimately help him increase his investments in a better way. Post Office Monthly Income Scheme for senior citizens is ideal as it can help secure their financial future. The POMIS allows you to withdraw your investment before completion of the tenure. However, this involves a penalty. Withdrawing the amount between one and three years results in a 2% deduction on the deposit amount, while after three years there is a 1% penalty deduction on the amount. Who should invest in Post Office Monthly Scheme? This scheme is best suited for risk-averse investors, especially those who are not comfortable with equity instruments. Post Office MIS scheme is suitable for senior citizens and retirees, as it allows them to earn a regular income. However, a major drawback of investing in POMIS is that the amount does not offer any tax rebate. And while your investment is not subjected to TDS (Tax Deduction at Source), interest earned on the amount is taxable. Assess your main priorities; if the safety of your capital and regular returns is important to you, you should definitely consider investment in post office.